OpenContracting Description: The identifier for this contract. OpenContracting Description: The Award.id against which this contract is being issued. OpenContracting Description: The current status of the contract. pending - this contract has been proposed, but is not yet in force. It may be awaiting signature. active - this contract has been signed by all the parties, and is now legally in force. cancelled - this contract has been cancelled prior to being signed. terminated - this contract was signed and in force, and has now come to a close. This may be due to a successful completion of the contract, or may be early termination due to some non-completion issue. OpenContracting Description: The start and end date for the contract. OpenContracting Description: The goods, services, and any intangible outcomes in this contract. 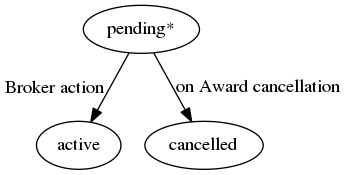 Note: If the items are the same as the award do not repeat. OpenContracting Description: The total value of this contract. OpenContracting Description: The date the contract was signed. In the case of multiple signatures, the date of the last signature. OpenContracting Description: All documents and attachments related to the contract, including any notices.